Orochi's nose will blow red! 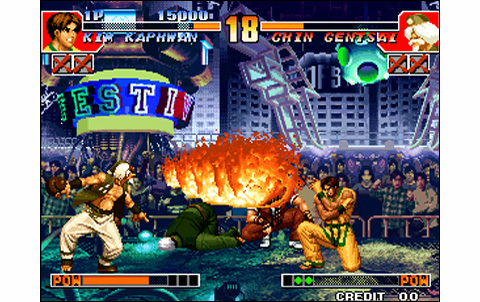 For its fourth episode, the King of Fighters saga do not do things by halves, judge by yourself: 460 megs cartridge, roster of twenty-nine + six hidden warriors, new story about the tournament... but also arrival of a few newcomers in the series! 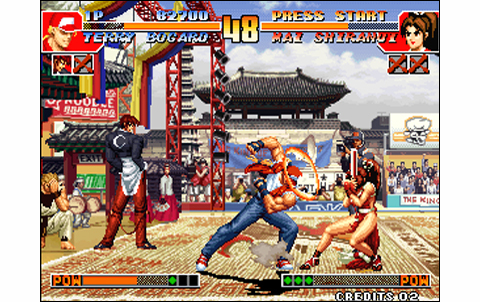 Among others, Yamazaki and Blue Mary of Fatal Fury now join KOF, while Yashiro, Shermie and Chris appear as a new team; Shingo came solo, Chizuru joined the team of King and May, while Billy Kane makes his come-back. All this promises a lot, especially since the 96' episode had been a dramatic facelift to the series. The character design has not changed much, except for some alterations and new steps for animation. Newcomers integrate seamlessly into the landscape. Only portraits of the fighters are a bit special, and probably will not satisfy everybody. Anyway the backgrounds are still gorgeous, very realistic, both in terms of colors and of style. 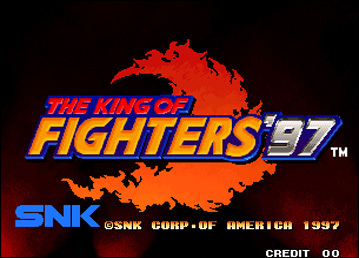 It differs a little from Kof 96, finally say specifically that it evolved. It seems that for most of them, SNK has based these on existing landscape pictures, then translated into backgrounds for the Neo Geo. The result is beautiful and colorful, but limited: only seven stages, that's few. However, those are detailed and lively, as well as evolutive for some. The animation - that had experienced a great evolution from 95 to 96 - was once again reworked and improved. You get more speed, and new steps of animation for many fighters. Fluidity is increased and the dynamism of the fights comes to new heights. By cons, there are slowdowns during combats. 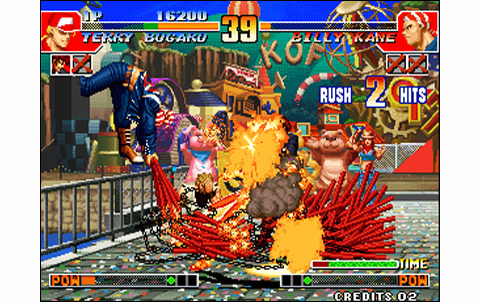 By simply performing certain special moves, for example Iori's '100 Oniyaki', causes significant falls of frame-rate. This is unfortunate because the timing is thereby a little upset when you're performing a combo: one must learn to consider it, and it isn't necessarily easy! Despite this detail, the gameplay is not really altered, rest assured. 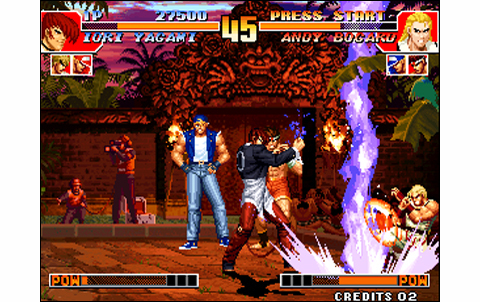 The game contains new combos, and new special moves for some characters. The hitbox have gained in precision and timing is better thought than before, despite these few 'lags'. You can now choose between two power gauges: Extra or Advanced. 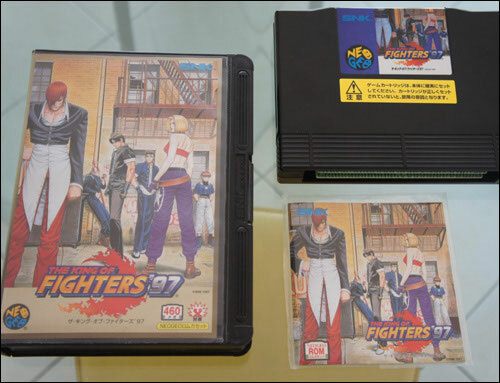 The first one packs the basics of Kof 94 and 95. Load the gauge by depressing A+B+C at any time and dodge with A+B. You can run, leap forward and perform a backdash. Moreover, when the health bar is very low, you can use Desperation Moves at will. In 'Advanced' mode, entering special moves and combos will automatically fill the gauge: one stock can already run a DM, whereas with two, one must first activate (A+B+C) before performing the maneuver, which therefore consumes two gauges. For the rest, this game mode integrates the A+B roll appeared in Kof 96. 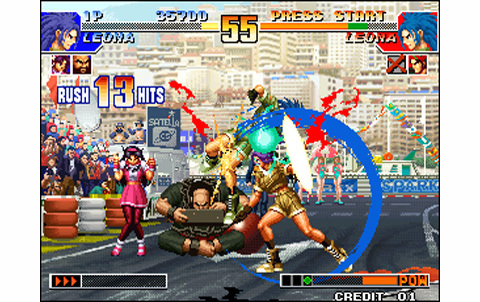 With these interesting new modes and no less than thirty-five playable characters, no doubt that any player will find happiness playing Kof 97'. You can still build team of three freely, but to see the ends of the game you'll have to play with the "core" teams. The story mode is really nice with cutscenes, interludes and dialogues between characters. Players have to face other teams in the tournament until the final, before the surprise: no less than five Bosses are waiting for you! Versus mode is still as attractive, with this plethora of fighters and the possibility to change characters after each battle. The game features a survivor mode, for the tough ones. 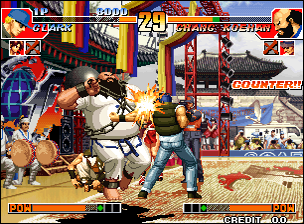 KOF 97 is a monster of replay value! Sound side, the orchestration is sublime, embellished with powerful and slaping sound effects. The speaker commenting the action is charismatic, completing this excellent package. But! The result is a good notch below the past productions because of the mix: the musics stop between rounds, and some characters simply have no themes. 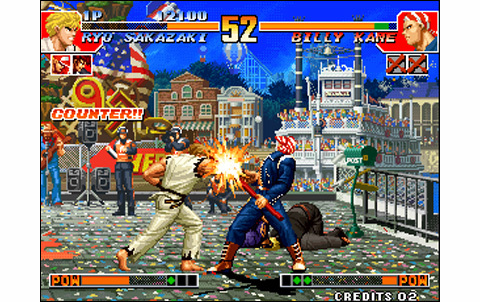 We then have an audio atmosphere for each stage, which are successful but not really appropriate for Kof's intense fights. Proof is, SNK will not renew this experience in the future. 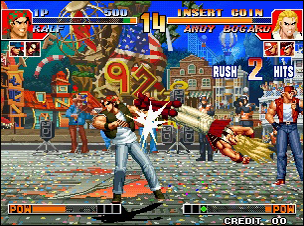 Apart from this particular soundtrack and these few slowdowns, The King of Fighters 97 is a great millesime. It quickly passed into the shadow of the fabulous 98' episode, and that's a shame! The story mode and ambiance of our 97' are very specific, and it would be a shame to miss it. With its exotic touch either in atmosphere or backgrounds, it could surprise many players. Beautiful backgrounds, but only seven different ones. Characters have improved again, yet there's only the new portraits that are... debatable. It's a little faster and decomposed since Kof 96. We can only deplore some big slowdowns during certain special moves. Effects are as good as ever, speaker is powerful, themes are rocking but... some flaws tarnish the picture: musics stop between rounds (!) and the fact to prefer ambiance themes of each stage is not a good idea. Up to 35 selectable fighters with codes, it's a big, big roster! Newcomers replace the characters that left since 96'. The story mode is one of the best of the series, with kinematics and great endings for each team. Timing is improved, Avanced and Extra modes appear. 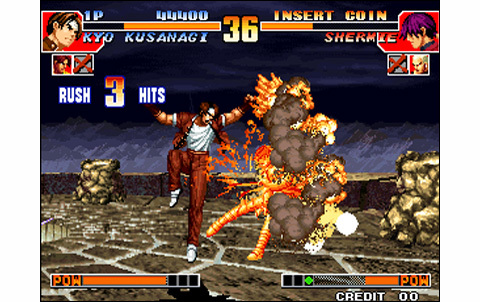 Multiple furies, even more combos: Kof 97 rocks! Being kind of 'Special', this episode packs a lot of qualities. 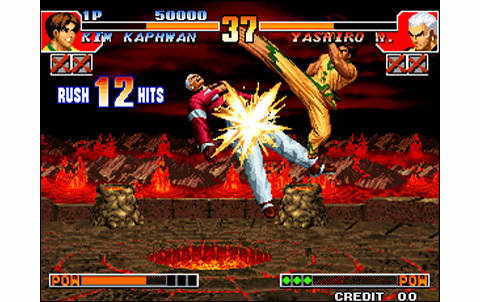 One more must-have Kof episode. One more time A kof game offering an excellent rate, with a n AES japanese cartridge costing about 60 euros. In fact, the only difficulty with these is to choose between all the episodes of the saga that have been released until now!